Monterey Consultants donated over 300 cans of food and an additional 300 dollars to the Dayton VA Food Pantry. 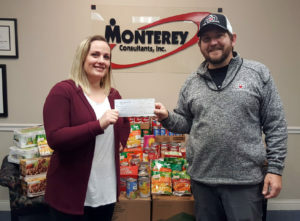 Originally with a goal of 150 cans by December 17th, Monterey employees exceeded this goal by December 10th and set out to double their goal. Monterey employees donated 302 cans in 3 weeks, with the company matching a dollar for every can donated. The cans will go directly to the Dayton VA Food Pantry, but the money will go to help The Heart Failure and Diabetic Food Box Program. When Cardiologists and Diabetes Specialists identify a patient with food insecurities, they can write the patient a “food prescription”. The patient can then go to the Dayton VA Food Pantry where they will be given a box of food that fits their needs. It is estimated that these boxes will cost 18-23 dollars each. 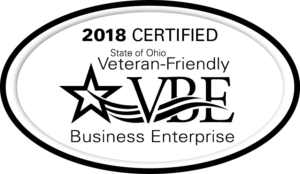 This project is currently in the development phase while the VA continues to raise money for this project. If you would like to help those in need please make donations to the Dayton Food Pantry and specify that you want you donation to be directed to The Heart Failure and Diabetic Food Box Program. 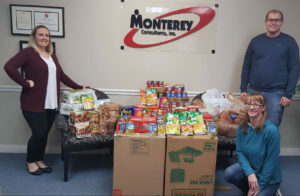 While the food drive is over, Monterey will continue to help by setting up a company volunteering program to help the Dayton VA Food Pantry set up and restock.